Keywords they should meditate on are prosperity, freedom, wealth, clarity, and destiny. The Eagle is the fifteenth Mayan day sign and considered one of the most powerful day signs. It is also known by the name of Men. In Mayan legend the sun was a symbol for an eagle. 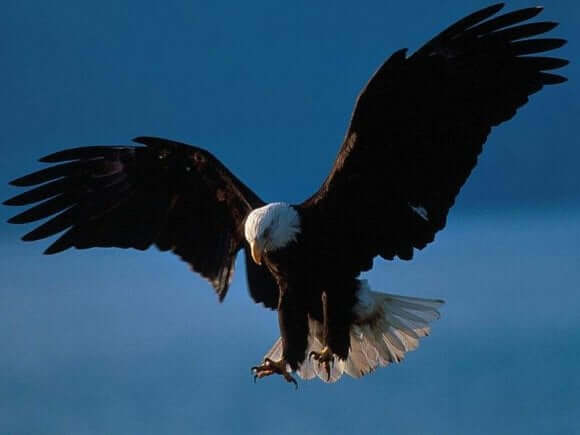 The eagle has double symbolic meanings to it. It represents the sun and the moon. Like the bird, Maya Zodiac Sign Eagle people love their freedom. They love to be free to explore. They are free spirits who prefer to spend time alone vs. spending time with people. They love to escape from reality, from rules, and from society in general. They need their freedom to find who they are so they can express themselves to their community and anyone who can benefit from their high view on life. Their minds are always in the clouds and their imaginations know no bounds. They love to talk about philosophy and life and often make great professors as they have a lot of wisdom to pass on to their students. In relationships the Maya Eagle horoscope sign are quite lucky. They will have an easy time finding and keeping a relationship. Wealth comes just as easily to these people. They tend to have wonderful lives when they are in balance both spiritually and mentally. They can make good spiritual advisers, teachers or anything in the healing profession such as doctor, psychologist or even massage therapist. The Mayan Men sun sign tend to be perfectionists who pay attention to every little detail. They are very left brained in that they think in very technical terms. They are attracted to subjects in science and philosophy and any subject they find mentally stimulating. They are very intelligent and independent. They are outgoing and friendly and have a personal magnetism that attracts and influences many people. They will focus their analytical minds to plot out a course of action, and calculate what needs to be done in order to produce the best outcome. Eagle Maya sign people can get bored very easily and lose interest. When they are out of balance this makes it hard to have a successful relationship as they are prone to being unfaithful. Their drive and uncontrolled ambition can make them over-step their boundaries to get what they want. They can be too opportunistic and irresponsible. They can keep their distance from others and are considered stand-offish and aloof. Despite their powerful intellect they can also be very by the book. They can be stubborn and stuck in their ways making it hard to break negative habits. If they want to be more in balance they should remember to not take everything so seriously. Have a more laid back attitude which will improve their personal and business relationships. If they don’t take their mission in life seriously they are prone to have health problems that stem from worrying too much and from uncontrolled anger. An Eagle day is a good time to ask for wealth or love. If you need protection for your business an Eagle day is a good day to ask. Ask for protection of your family and friends. Those who are farmers or have crops may ask for them to be harvested without damage. Lucky Direction: The lucky direction for the Maya Men sign is WEST. Lucky Color: The lucky colour for the Mayan Eagle sign is BLUE. Lucky Gemstone: The lucky gemstone for the Eagle Maya sign is UNAKITE. Animal Totems: The animal totem for the Men Mayan zodiac sign is EAGLE or QUETZAL. Mayan Astrology Compatibility: The direction of the day sign Eagle is the West and it is compatible with others signs from the West such as Deer, Monkey, Rainstorm, and Dawn. It is also compatible with signs from the East such as Serpent, Crocodile, Reed, Offering, and Knowledge.